I'm always on a mission to find dinners that are easy to prep and cook and take little time from stovetop to table. When I can pair that winning combo with something that also tastes delicious and has me going back for thirds?!?! That my friends is what I call 'winning'. Yes. Winning in every way possible. If you're a fan or these flavors, I think you'll feel the same. I know that might look like "a lot" of ingredients, but chances are likely that you already have most of them on hand AND the prep takes no time at all (especially if you gather all the ingredients together before measuring and dumping). Brown the chicken in a skillet with a tablespoon of olive oil and two teaspoons of minced garlic and remove from heat. In a medium bowl, add the orange juice, zest, soy sauce (I used liquid aminos), apple cider vinegar, brown sugar, garlic, ground ginger, and crushed red pepper flakes. In a small bowl, add the water and cornstarch and mix until combined. Add the water/cornstarch mixture to the medium bowl and use a whisk to blend until ingredients are combined. Heat the liquid mixture in a small saucepan over medium heat. Cook until the mixture thickens. As the OP says, "it should be thick enough to coat the back of a spoon". I didn't spoon check it, I just kept an eye on it and continued to stir until I felt it was thick enough. Once the sauce thickens, remove from heat and pour over the chicken (still in the skillet). Mix well and then continue to cook over medium heat for 1-2 minutes. Remove from heat. 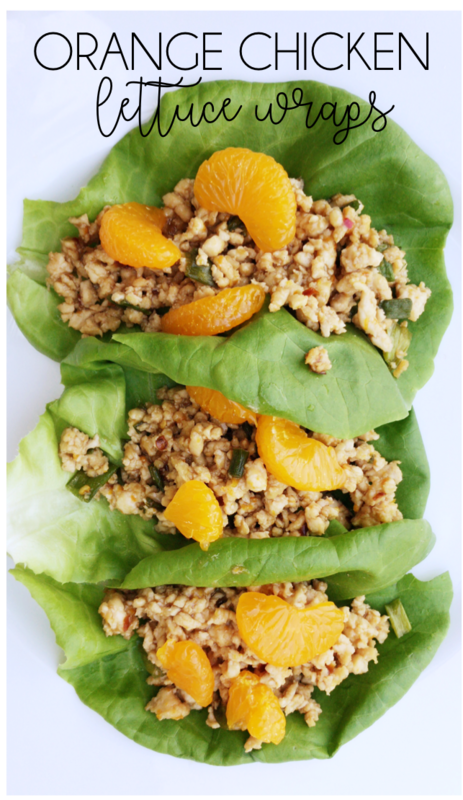 To prep, scoop a few spoonfuls of the chicken/sauce mixture onto a lettuce leaf. 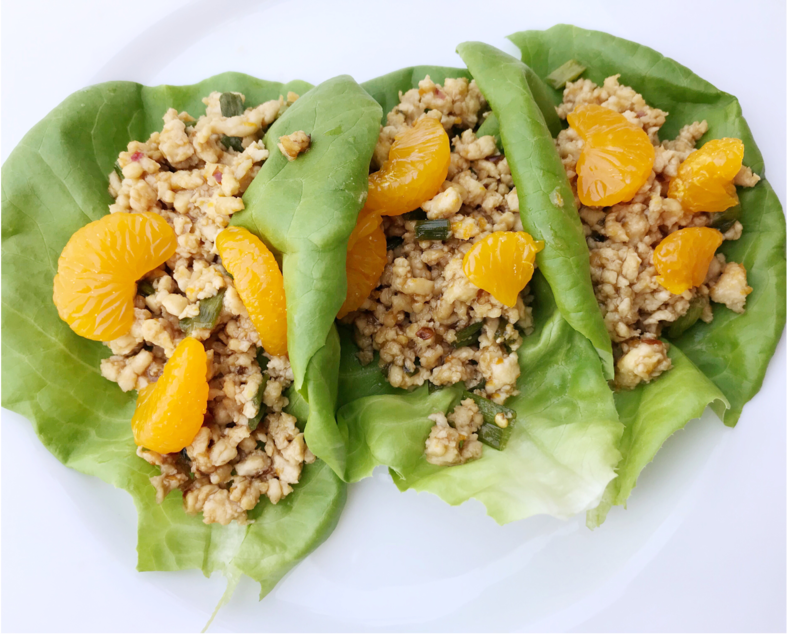 Top with green onion, mandarin oranges, and sesame seeds. We skipped out on the sesame seeds and loaded up on the green onion and a few mandarin oranges. DELICIOUS. I should also mention that we spiced it up a little bit more with Chili Garlic sauce. Ummmm. It was amazing, but my mouth is still on fire. If you're not a fan of spice, don't go that route. Honestly, the chicken mixture is fine as is! You can reserve a little of the sauce to drizzle on top once you prep the wraps if that's your style. I can't say enough good things about this meal. Took me about 20 minutes from start to finish and I'm pretty sure we devoured an entire pan full in less than 10. Ha. Really, really tasty. We've had these several times in the past year and will definitely be having them a lot more in the year to come! WINNING for sure!